hello again! 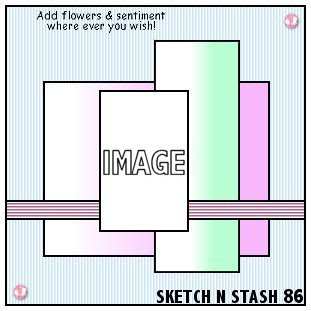 I have followed another sketch for this card, this time I have chosen sketch 86 over at Sketch and Stash. This is another card I did yesterday from my spree at Saturated Canary. This boy's called sporty guy and he is so cute...now you know boys cards are not my thing, but when I saw him, I knew I had to have him!! He's a dream to colour up- in fact I used only one blue copic and one red copic with a dash of grey for his uniform! (told ya my collection is not big!) The papers are from a couple of stacks I've had for YEARS so dont know what barnd they are. I have used some blue moonstone brads from WOC. I need to get some twine from WOC too 'cause I think some twine on this card would've been perfect. Thankyou for popping by I love that you can take time to leave lovely comments. Thank you for joining us again at Sparkles challenges for our * Summer Fun * challenge. Wonderful card, I like the image and the papers, Thank you for joining in with us at Sketch N Stash, Good Luck. Super adorable card!! Love the fabulous papers and that cute image!! Love it! A fantastic card, fabulous colours and patterns, your image is brilliant. What a fun birthday card! Any child would love to receive this great card! Thanks for sharing it with us at Send a Smile 4 Kids and good luck in the drawings! Adorable card, thanks for playing along at SNSDC this week.